本申请提供了一种输入设备，其通过对感应区中的多个对象的每一个确定力信息来帮助提高用户界面的功能性。 The present application provides an input device, by force determined for each of a plurality of objects in the sensing region information to help increase the functionality of the user interface. 输入设备包括处理系统，配置成感应在贴近表面的感应区中的对象的传感器，和多个力传感器。 The input device includes a processing system configured proximate to the surface of the sensor senses an object in the sensing region, and a plurality of force sensors. 所述多个力传感器与表面耦合以提供多个对施加在表面上的力的测量。 The surface of said plurality of force sensors coupled to provide a plurality of measurements of forces exerted on the surface. 处理系统被配置成为感应区里的传感器感应到的多个对象中的每一个确定位置信息。 The processing system is configured to determine a position information of each of a plurality of objects in the sensing region of the sensor senses. 此外，处理系统被配置成从作用在表面上的力的位置信息和多个测量为多个对象中的每一个确定力信息。 Further, the processing system is configured from a force acting on the surface position information and the plurality of measured force is determined for each of the plurality of information objects. 这样，设备和方法提供了确定感应区里多个对象中每一个的位置信息和力信息二者的能力。 Thus, methods and apparatus provided for determining a plurality of objects in the sensing region in each of the capabilities of both the position information and force information. 本申请要求于2009年12月14日提交的序号为12/636,952的美国专利申请的优先权，其通过引用结合于此。  This application claims Serial No. 14 December 2009, filed priority to U.S. Patent Application 12 / 636,952, which is incorporated herein by reference. 本发明总体上设及电子设备，更具体设及传感器设备和利用传感器设备来产生用户界面输入。  In general the present invention is provided and an electronic apparatus, and more particularly to a sensor device provided with the sensor device and to generate user interface input. 接近传感器设备(通常也被称作触摸传感器设备)被广泛应用于各种电子系统。  The proximity sensor device (also commonly referred to as a touch sensor devices) are widely used in various electronic systems. 接近传感器设备通常包括感应区，其通常被表面所划分，在其中可W检测到输入对象。 The proximity sensor device typically comprises a sensing region, which is usually divided surface, in which W is detected in the input object. 示例输入对象包括手指、笔尖等等。 Example input object comprises a finger, pen and the like. 接近传感器设备可W使用一个或更多的基于电容性、电阻性、 电感性、光学、声学和/或其他技术的传感器。 The proximity sensor device may use one or more W based on capacitive, resistive, inductive, optical, acoustic and / or other sensor technologies. 此外，接近传感器设备能确定在感应区中的单个输入对象的存在、位置和/或运动，或者同时确定在感应区中的多个输入对象的存在、位置和/或运动。 Further, the proximity sensor device can be determined that there is a single input object in the sensing region, the position and / or motion, or simultaneously determining the presence of a plurality of input objects in the sensing region, the position and / or motion. 接近传感器设备可W被用来使能对相关的电子系统的控制。  W proximity sensor device can be used to enable the associated electronic control systems. 例如，接近传感器设备经常被用作比较大型的计算机系统的输入设备，包括:笔记本电脑和台式机。 For example, the proximity sensor devices are often used as an input device a relatively large computer system, comprising: laptops and desktops. 接近传感器设备也经常被用于较小的系统中，包括:如个人数字助理(PDAs)、远程控制运样的手持系统和无线电话和短信系统运样的通讯系统。 The proximity sensor devices are also frequently used in smaller systems, comprising: such as personal digital assistants (PDAs), handheld remote control sample transport system and radio telephone system and the sample transport messaging communication system. 接近传感器设备越来越多地被用到了媒体系统中，比如〔0、0¥0、1?3、视频或者其他媒体记录器或播放器。 The proximity sensor devices are increasingly being used in the media system, such as [0,0 ¥ 0,1? 3, video or other media recorder or player. 接近传感器设备可^是与其交互的计算系统的组成部分或外设。 ^ Proximity sensor device can be an integral part of the peripheral or interact with the computing system. 过去，一些接近传感器已经被实施W额外的能力来检测并确定作用到传感器表面的力。  In the past, a number of additional proximity sensors have been implemented ability to detect and determine the role of W to a force sensor surface. 比如，通过从测量当手指按压表面时由于增加的接触面积而造成的增大的电容来估计作用力。 For example, when measured by the increased capacitance due to the increased contact area of ​​the finger pressing surface caused estimated force. 不幸的是，运些接近传感器的一些实施在使用运些技术估计作用力时只有有限的准确性。 Unfortunately, some proximity sensors shipped to some embodiments of these techniques when using transport is estimated force only limited accuracy. 因为受到质疑的准确性，运样的传感器通常只有有限的能力来使用运样被确定的力作为确定用户输入的基础。 Because challenged the accuracy of the sample transport sensors typically have limited ability to use the sample transport force is determined as a basis for user input. 运限制了接近传感器设备作为输入设备工作的灵活性。 Transport limits the proximity sensor device to work as an input device flexibility. 因此，存在对接近传感器设备改进的需求，尤其是接近传感器设备确定和响应于作用力的指示的能力。 Thus, there is an improved proximity sensor device's needs, especially capacity proximity sensor device in response to the determination and indication of force. 从随后的详细描述W及所附权利要求，结合附图和上述的技术领域和背景，其他理想的特征和特点会变得显而易见。  W from the following detailed description and appended claims, taken in conjunction with the accompanying drawings and the foregoing technical field and background, other desirable features and characteristics will become apparent. [000引本发明的实施例提供了促进设备可用性的提高的设备和方法。 [000 cited embodiment of the present invention provide improved apparatus and method to promote the availability of equipment. 具体来说，运种设备和方法通过帮助从在感应区中多个对象中每一个的位置信息和力信息二者确定用户输入来提供改进的用户界面功能性。 Specifically, the operation types of apparatus and method to provide an improved user interface functionality from each of both the position information and force information to determine user input objects in the sensing region by the plurality of help. 输入设备包括处理系统，被配置成感应贴近表面的感应区中的对象的传感器，W及多个力传感器。 The input device comprises a sensor processing system is configured to sense the surface proximate object sensing zone in the, W, and a plurality of force sensors. 多个力传感器被禪合到表面W提供对作用在表面的力的多个测量。 Zen plurality of force sensors are bonded to the surface W to provide a plurality of measuring force acting on the surface. 处理系统被配置成为对感应区中传感器感应到的多个对象中每一个确定位置信息。 The processing system is configured to determine a position information of each of a plurality of objects in the sensing region of the sensor senses. 此外，处理系统被配置成从作用在表面的力的被确定的位置信息W及多个测量为多个对象中的每一个的确定力信息。 Further, the processing system is configured from a force acting on the surface is W and the determined location information to determine a plurality of measured force information of each of a plurality of objects. 因此，设备和方法提供了为感应区中多个对象中每一个确定位置信息和力信息二者的能力。 Accordingly, the apparatus and method provides the ability to determine both the position information of each sensing region and force information for the plurality of objects. 运可W被用于帮助提高用户界面功能性，比如， 通过规定特定用户界面动作响应于对多个对象的力的确定指示。 Yun W can be used to help improve the functionality of the user interface, for example, by specifying a specific operation of the user interface in response to a determination that an indication of the force of the plurality of objects. 图8是使用一维轮廓来确定对象位置的示例性接近传感器的俯视图。  FIG. 8 is a one-dimensional profile of the object to determine the position of a top view of exemplary proximity sensor. [001引W下的详细描述实际上仅是示例性的，并非为了限制本发明或本发明的应用及使用。 [001 cited in the detailed description of W is merely exemplary, and not intended to limit the present invention or the application and uses of the present invention. 此外，也不存在由在前述技术领域、背景技术、发明内容或W下的详细描述中呈现的明示或暗示的理论所限制的意图。 Furthermore, there is no intent expressed by the theory in the preceding technical field, background, the following detailed description of the invention presented content or W or implied restricted. 本发明的实施例提供帮助提高设备可用性的设备和方法。 Example  The present invention provides assistance apparatus and method for improving the availability of equipment. 具体说来，该设备和方法通过帮助对感应区中多个对象中每一个的位置信息和力信息的二者的确定来帮助提高用户界面功能性。 Specifically, the apparatus and method to help determine the position information and force information sensing region of each of the plurality of objects to help to improve both the user interface functionality. 现在转到附图，图1是一个示例性电子系统100的框图，其W输入设备116操作。  Turning now to the drawings, FIG. 1 is a block diagram of an exemplary electronic system 100, the input device 116 W operation. 正如将在下文更详细地讨论的那样，输入设备116可W被实施为作为电子系统100的接口工作。 As will be discussed in greater detail below, the input device 116 W can be implemented to operate as an interface 100 of the electronic system. 输入设备116具有感应区118并且被实施为具有处理系统119。 The input device having a sensing region 118 and 116 is implemented with a processing system 119. 图1中没有示出的是适于感应在感应区118中的对象的感应电极的阵列。 FIG. 1 is not shown in the array of sensing electrodes adapted to sense an object in the sensing region 118. 图1中没有示出的还有禪合到感应区118下的表面W对作用到表面的力提供多个测量的多个力传感器。 The plurality of forces is not shown in FIG 1 there is bonded to the Zen sensing region 118 of the force acting on surface W surface provides a plurality of measurement sensors. 输入设备116适于通过帮助响应于感应到的对象及运些对象作用的力的数据输入来提供用户界面功能性。  The input device 116 is adapted to provide user interface functionality with the help of the object in response to the sensed force and the operation of these objects a data input function. 具体说来，处理系统119被配置成对由感应区118中的传感器感应到的多个对象确定位置信息。 Specifically, the processing system 119 is configured to a plurality of objects sensed by the sensors in the sensing region 118 to determine location information. 然后此位置信息可W由系统100使用来提供广泛的用户界面功能性。 This location information may then W offers extensive user interface functionality 100 used by the system. 此外，处理系统119被配置成从力传感器确定的力的位置信息和多个测量来为多个对象中的每一个确定力信息。  In addition, the processing system 119 is configured to determine each of the force information from the force sensor determines a position information and a plurality of power measurements of a plurality of objects. 此力信息然后可W也被系统100用来提供广泛的用户界面功能性。 This information can then force W can also be used to provide a wide range of the system 100 user interface functionality. 比如，通过响应于在感应区中多个对象中的每一个作用的力的不同级别提供不同的用户界面功能。 For example, in response to a function of providing different user interfaces in the different levels of force sensing region of each of a plurality of objects acting. 因此，输入设备116的处理系统119提供了对感应区中多个对象中每一个的位置信息和力信息二者进行确定的能力。 Thus, the input device 116, the processing system 119 provides the ability to both the position information and force information sensing region of each of the plurality of objects of determination. 运可W被用来帮助提高用户界面功能性，例如， 通过规定特定用户界面动作来响应多个不同对象的力的确定的指示。 W may be transported to help improve the user interface functionality, e.g., an indication of the force is determined in response to a plurality of different objects by specifying a particular user interface action. 在一个实施例中，处理系统119被配置成基于多个对象中每一个的位置信息利用力的多个测量的叠加来确定多个对象中每一个的力信息。  In one embodiment, the processing system 119 is configured to overlay a plurality of objects based on the plurality of measurement information of each position is determined by the force of the force information of each of the plurality of objects. 此外，在本实施例的一个具体实施中，处理系统119被配置成利用伪逆矩阵技术确定多个对象中每一个的力信息。 Further, in a particular embodiment of the present embodiment, the processing system 119 is configured to determine power information of each of the plurality of objects using a pseudo inverse matrix technique. [0021 ] 现在回到图1，如前所述，输入设备116包含一感应区118。  Returning now to FIG. 1, as described above, the input device 116 includes a sensing region 118. 输入设备116对一个或更多个输入对象(比如手指，笔尖等)的输入敏感，例如感应区118中输入对象114的位置。 The input device 116 inputs one or more input objects (such as a finger, pen, etc.) sensitive to, for example, the input position of the object 114 in the sensing region 118. 运里使用的"感应区"旨在广泛涵盖输入设备的上方，四周，里面和/或附近的任何空间，其中输入设备的传感器能检测用户输入。 Used in the operation "sensing area" is intended to encompass a wide range of input devices above, around, inside and / or any space nearby, wherein the input device sensor can detect a user input. 在常规的实施例中，输入设备的感应区从输入设备的传感器的表面沿一个或多个方向延伸到空间中，直到信噪比妨碍充分精确的对象检测。 In the conventional embodiment, the input device sensing area from the surface of the input device along the one or more sensor extending into the space until a sufficiently accurate SNR interfere object detection. 在一具体方向上感应区延伸的距离可能在不足一毫米，几毫米，几厘米或更多的级上，并且可能随使用的感应技术类型和要求的精度而显著变化。 In a particular direction extending from the sensing region may be less than one millimeter, a few millimeters, centimeters or more stages, and the type of sensor technology and accuracy requirements may be used with vary significantly. 因此，一些实施例可能需要与表面接触， 要么具有作用的压力要么不具有，而其他的一些又不需要。 Accordingly, some embodiments may require contact with the surface, or pressure has the effect of either does not have, and some others do not. 相应的，在不同的实施例中，特定感应区的尺寸、形状和位置可能有很大的差别。 Accordingly, in various embodiments, the size, shape and location of a particular sensing area may be very different. 常见的感应区具有矩形二维投影形状，但也可能是许多其他的形状。  The common sensing region has a rectangular shape two-dimensional projection, but it could be many other shapes. 例如，根据传感器阵列和周围电路的设计，针对输入对象的防护，等等，感应区可能被做成具有其他形状的二维投影。 For example, depending on the design of the sensor array and the peripheral circuit, an input object for protection, and the like, the sensing region may be made into two-dimensional projections having other shapes. 类似的方法可W被用来限定感应区的=维形状。 Similar methods may be used to define W =-dimensional shape of the sensing region. 例如，传感器设计、防护、信号操作等等的任何组合，可有效限定延伸一段距离进出图1中的页的感应区118。 For example, any combination of sensor design, protection, operation signal or the like, which can effectively define a sensing region extend a distance out of the FIG. 1 on page 118. 在运行中，输入设备116适宜地检测感应区118内一个或更多个输入对象(如输入对象114)。  In operation, the input 118 of one or more target input device 116 suitably detects the sensing region (e.g., 114 input object). 因此，输入设备116包含一传感器(未示出），其利用任何组合传感器元件和传感技术来实现一个或更多的感应区（如感应区118)并检测如对象的存在的用户输入。 Thus, the input device 116 includes a sensor (not shown), which sensor element and using any combination of sensing technology to implement one or more sensing regions (e.g., sensing region 118) and detects the presence of the user input as an object. 输入设备可W包含任何数量的结构，比如一个或更多的传感器电极，一个或更多的其他电极或者是适于检测对象的存在的其他结构。 W input device may comprise any number of structures, such as one or more sensor electrodes, one or more other electrodes or other structures adapted to detect the presence of the object. 作为一些非限制性的例子，输入设备可W使用电容的、 电阻的、电感的、表面声波和/或光学技术。 As a non-limiting example, W input device may use capacitive, resistive, inductive, surface acoustic waves and / or optical techniques. 运些技术中许多对需要移动机械结构（比如机械开关)的那些是具有优势的，因为他们可具有长得多的使用寿命。 Many of these transport technology is advantageous, because they can have a much longer service life for those who need to move mechanical structures (such as mechanical switch). 例如，输入设备116中的传感器可W使用电容式传感器电极的阵列或其他模式来支持任何数量的感应区118。  For example, input device 116 may be a sensor or other mode using the array W capacitive sensor electrodes to support any number of sensing region 118. 作为另一个例子，传感器可W用电容传感技术，结合电阻传感技术来支持同一感应区或不同的感应区。 As another example, the sensor may be W capacitance sensing technology, resistive sensing technology to support binding the same or a different sensing region of the sensing region. 可用于实现本发明各种实施例的运些技术类别的示例可W 在美国专利号5,543，591,5,648,642，5,815,091，5,841,078 和6,249,234 中找到。 These exemplary techniques can be shipped category for implementing various embodiments of the invention W may be found in U.S. Patent No. 6,249,234 and in 5,543,591,5,648,642,5,815,091,5,841,078. 在一些电容性输入设备的实施中，作用W电压来产生跨越感应表面的电场。  In some of the embodiments of the capacitive input device, the effect of voltage generates an electric field across the W sensitive surface. 运些电容性输入设备通过检测电容变化来检测对象的位置，而电容变化是因对象引起的电场变化而造成的。 These capacitive input operation device to detect a position of an object by detecting a change in capacitance due to changes in the capacitance change is caused by an electric field caused by the object. 传感器可W检测电压、电流等等的变化。 W detection sensor may vary voltage, current, or the like. 作为一个例子，一些电容性实现利用电阻片，其可W统一是电阻性的。  As an example, some of the capacitive implemented using resistors, which may be resistive W unity. 运种电阻片电(通常欧姆性地)禪合到电极。 Electrically resistive sheet transported species (typically ohmically) Zen bonded to the electrodes. 在一些实施例中，运些电极可能位于电阻片的拐角，为电阻片提供电流并检测通过电容性禪合到电阻片上被输入设备引出的电流。 In some embodiments, these electrodes may be transported around the corner of the sheet resistance, and to provide current to resistive sheet is detected by the capacitive device current drawn Zen bonded to the resistive sheet is input. 在另外的实施例中，运些电极位于电阻片的其他区域，并且驱动或接收其他形式的电信号。 In a further embodiment, the transport of these electrodes located in other areas of the sheet resistance, and other forms of driving or receiving electrical signals. 根据实施，传感器电极可W被看作电阻片，禪合到电阻片的电极或者电极和电阻片的组合。 According to an embodiment, the sensor electrode may be regarded as resistive sheets W, the Zen bonded to an electrode or a combination of the electrode and the sheet resistance of the resistive sheet. 作为另一个例子，一些容性实现利用基于传感器电极之间的电容性禪合的跨电容感应方法。  As another example, some of the cross-capacitance capacitive sensing method implemented by the capacitive Chan engagement between the sensor electrode based. 有时也把跨电容感应方法称作"互电容感应方法"。 Sometimes the cross-capacitance sensing method referred to as "mutual capacitance sensing method." 在一实施例中，跨电容传感方法通过检测将一个或更多的发射电极与一个或更多个接收电极禪合起来的电场而运作。 In one embodiment, the capacitive sensing method across one or more emitter electrode and the one or more receiving electrodes Zen combined operation by detecting the electric field. 贝占近的对象可W引起电场的变化，并在跨电容禪合中产生可检测到的变化。 Object shellfish accounting for nearly W may cause changes in the electric field, and produces a detectable change in capacitance across the Zen fit in. 传感电极既可W 发射也可W接收，要么同时要么W分时复用的方式。 W emission sensor electrodes can also be received W, W either simultaneously or time-multiplexed manner. 有时把发射的传感电极称作"发射传感器电极"，"驱动传感器电极"，"发射器"或"驱动"一一至少在它们正在发射的期间。 Sensing emitter electrode sometimes referred to as "transmitting sensor electrode", "drives the sensor electrode", "emitter" or "drive" eleven least during their being transmitted. 也可W 用其他名字，包括对前面的名字的缩写或组合(例如"驱动电极"和"驱动器电极"）。 W may also be other names, including the foregoing, or a combination of name abbreviation (e.g., "drive electrode" and the "drive electrode"). 有时把接收的传感器电极称作"接收传感器电极"，"接收电极"或"接收器"一-至少在它们正在接收的期间。 Receiving sensor electrodes sometimes referred to as "receiving sensor electrode", "receiving electrode" or "receiver" a - at least during their being received. 同样的，也可W用其他名字，包括前面的名字的缩写或组合。 Similarly, W may be other names, including abbreviated name or a combination of the foregoing. 在一实施例中，发射传感器电极被相对于系统地而调制W便于发射。 In one embodiment, the transmitting sensor electrode relative to the system to prepare W easy to transmit. 在另一实施例中，接收传感器电极未被相对系统地而调制W便于接收。 In another embodiment, the receiving sensor electrodes are not opposed to the system to prepare W facilitates receiving. [00%]除用来实现一个或更多个感应区的传感器元件和传感技术外，输入设备包括多个力传感器。 [00%], and other elements used to realize the sensor sensing techniques one or more sensing areas, the input device includes a plurality of force sensors. 多个力传感器被禪合到表面并被配置成提供作用到表面的力的多个测量。 Zen plurality of force sensors are bonded to a plurality of measurement surfaces and configured to provide a force acting to the surface. 正如下文将更详细地描述的那样，多个力传感器可WW多种不同的设置被实施。 As hereinafter described in greater detail above, a plurality of force sensors may be provided in many different WW embodiment. 举几个例子，多个力传感器可W被实施为设置在靠近感应区118的周边的=个或更多的力传感器。 A few examples, a plurality of force sensors can be implemented as provided W = or more force sensors close to the periphery of the sensing region 118. 此外，每个力传感器都可W被实施为测量作用在表面的压缩力、膨胀力或两者。 Further, each of the force sensors may be implemented as W compressive force measured surface, expansion force or both. 最后，多种不同的技术可W被用来实施力传感器。 Finally, a variety of different techniques may be used to implement the force sensor W. 例如力传感器可WW包括压电力传感器、电容性力传感器和电阻性力传感器的多种不同技术来实施。 The force sensor may comprise e.g. WW piezo-electric sensor, a variety of different technologies and capacitive force sensor resistive force sensor implemented. 图1中处理系统(或"处理器"）119被禪合到输入设备116和电子系统100。  FIG. 1 processing system (or "processor") 119 is bonded to the Zen input device 116 and the electronic system 100. 诸如处理系统119运样的处理系统可W对从输入设备116的传感器接和力传感器收到的信号进行各种处理。 Such as processing system 119 of the sample transport processing system may signal W received from the force sensor and the sensor is connected the input device 116 performs various processes. 比如，处理系统可W选择或禪合单个传感器电极，检测存在/接近，计算位置或运动信息或把对象运动解释为手势。 For example, the processing system can be selected or W Chan bonded single sensor electrode detects the presence / proximity calculates the position or motion information of the object motion or interpreted as a gesture. 处理系统还可W校准单个力传感器W及从力传感器提供的数据确定力的测量。 Processing system may also calibrate W W single force sensor and force sensor to provide data from the measurement of the force is determined. 处理系统119可W为电子设备100提供基于输入对象(如输入对象114)的位置信息和力信息的电气或电子标记。  The processing system 119 can provide W of the electronic device electrical or electronic marking position information and force information based on an input object (e.g., input object 114) 100. 在一些实施例中，输入设备使用相关的处理系统为电子系统提供位置信息和力信息的电子标记，而电子系统处理标记来基于来自用户的输入而动作。 In some embodiments, the input device using the associated processing system provides position information and force information of the electronic tag is an electronic system, and the electronic processing system based on the tag to an operation input from a user. 一个示例的系统响应就是在显示器上移动光标或其他对象，且标记可WW任何其他目的而被处理。 The system response is one example of moving a cursor on a display or other object, and may be labeled WW be processed for any other purpose. 在运样的实施例中，响应于识别出的对象运动的一笔，或基于任何数量和种类的标准，当达到阔值时，处理系统可W不断地向电子系统报告位置和力信息。 In an embodiment the sample transport in response to a sum of the identified object motion, or based on any number and variety of standards, when the value reaches width, W processing system may constantly reporting location information to an electronic system and force. 在其他一些实施例中，处理系统可W直接处理标记来接收来自用户的输入，并且不与任何外部处理器进行交互就在显示器上产生变化或一些其他动作。 In some other embodiments, the processing system can be processed directly labeled W to receive input from the user, and does not interact with any external processor generates a change or some other action on the display. 在本说明中，术语"处理系统"被定义为包含一个或更多个适于实施所述操作的处理元件。  In this specification, the term "processing system" is defined as the processing element is adapted to contain one or more embodiments of the operation. 因此，处理系统（如处理系统119)可W包含一个或更多个集成电路、固件代码、和/ 或软件代码的全部或部分，其从传感器接收电气信号并与其关联的电子系统（如电子系统100)进行通信。 Thus, the processing system (processing system 119) may comprise all or part of a W or more integrated circuits, firmware codes, and / or software code, which receives the electric signal from the electronic system and its associated sensor (e.g., electronic system 100) communicates. 在一些实施例中，所有包括处理系统的处理元件都定位在一起，在关联的输入设备中或附近。 In some embodiments, a processing system includes all of the processing elements are positioned together, at or near the associated input device. 在其他的实施例中，处理系统的元件可W是物理隔离的，一些元件靠近相关输入设备而一些元件在别处（比如靠近电子系统的其他电路）。 In other embodiments, the processing system element W may be physically separated, some elements of the input device near some of the elements associated elsewhere (such as other electronic system circuits near). 在后一个实施例中，最小量的处理可W通过输入设备附近的处理系统元件来执行，且多数的处理可W通过其他地方的元件来执行，反之亦然。 In the latter embodiment, W may be a minimum amount of processing performed by the input processing system elements nearby devices, and most of the processing may be performed by W elsewhere, and vice versa. 此外，处理系统（如处理系统119)可W是和与其通讯的电子系统（如电子系统100) 的一部分物理隔离的，或是处理系统和电子系统的那一部分一起被整体地实施。 Portion of the physical  In addition, the processing system (processing system 119) may communicate thereto and W is an electronic system (e.g., electronic system 100) is isolated, or it is implemented as part of the processing system together integrally and electronic systems. 例如，处理系统可W至少部分存在于被设计来实施除了实施输入设备外的电子系统的其他功能的一个或更多个集成电路中。 For example, the processing system W may be present at least partly designed to implement other functions in addition to one embodiment of the electronic system of the external input device or more integrated circuits. 在一些实施例中，输入设备可W被实施W通任何感应区外的其他输入功能性。  In some embodiments, the input device may be implemented other input W functional W through any of the outer sensing region. 例如，图1中的输入设备116被实施W感应区118附近的按钮或其他输入设备。 For example, the input device 116 in FIG. 1 embodiment W is close to the button sensing region 118 or other input device. 按钮可W被用来帮助使用接近传感器设备选择条目，为感应区提供冗余功能性，或提供一些其他功能性或非功能性的美化效果。 W button can be used to help select an entry device using a proximity sensor is provided for the redundancy of the sensing region, or providing other functional or nonfunctional beautifying effect. 按钮只是形成了怎样给输入设备116增加额外输入功能性的一个例子。 Button formed only one example of how the input device 116 to input additional functionality. 在其他的实施中，如输入设备116的输入设备可W包含替代的或额外的输入设备，比如物理的或虚拟的开关，或额外的感应区。 In other embodiments, the input device such as device 116 may comprise W alternative or additional input devices, such as physical or virtual switches, or additional sensing region. 相反，在各种实施例中，输入设备可W只W感应区输入功能性实现。 In contrast, in various embodiments, the input device may input sensing region W W only functionality is implemented. 同样地，任何位置信息确定的处理系统可W是对对象存在的任何适当的标记。  Likewise, any of the position information processing system W may be any suitable marker object exists. 例如，处理系统可W被实施成确定作为标量的"一维"位置信息（如沿感应区的位置或运动）。 For example, the processing system may be implemented W "one-dimensional" position information as a scalar (e.g., along the position or movement sensing region) to determine. 处理系统也可W被实施成确定作为组合值的多维位置信息（如二维水平/垂直轴，=维水平/垂直/深度轴，角度/径向轴，或跨多个维度的任何其他轴的组合），等等。 W processing system may also be implemented to determine multidimensional information as a combination of values ​​of the position (two-dimensional horizontal / vertical axes, = dimensional horizontal / vertical / depth axis, the angle / radial axis, or any other cross-axis dimensions of a plurality of combination), and so on. 处理系统也可W被实施成确定关于时间或历史的信息。 W processing system may also be implemented to determine the information about the time or history. 此外，运里所说的术语"位置信息"意在广泛涵盖绝对和相对位置类型的信息，W 及同样其他类型的空间域信息，比如速度，加速度等等，包括一个或更多个方向上的运动的测量。  Further, in the operation of said term "location information" is intended to broadly encompass absolute and relative positional information of the type, W, and other similar types of spatial-domain information, such as speed, acceleration, etc., comprising one or more measuring the movement direction. 各种形式的位置信息也可W包括时间历史分量，比如在手势识别的情况中等等。 Various forms of positional information may also include time history components W, etc. such as in the case of gesture recognition. 同样地，运里所说的术语"力信息"意在广泛涵盖任何形式的力信息。 Similarly, he said transport in the term "power of information" is intended to encompass a wide range of force information in any form. 例如，可WW向量或标量量为每个对象提供力信息。 For example, a vector or scalar quantity WW provide force information for each object. 作为另一个例子，可WW其确定的力有没有超过阔值量的指示提供力信息。 As another example, it may be determined WW there is no indication of the force exceeds the width information values ​​to provide a force amount. 作为另一个例子，力信息也可W包含用于手势识别的时间历史分量。 As another example, the force information may comprise a time history of the component W gesture recognition. 正如在下文作中将更详细地描述的那样，来自处理系统的位置信息和力信息可W被用来帮助全方位的界面输入，包括使用接近传感器设备作为选择、光标控制、滚动和其他功能的指向设备。 As will be described in detail below as the position information and force information from the processing system may be used to help round W input interface, using a proximity sensor comprising a device as a selection, cursor control, scrolling and other functions pointing device. 在一些实施例中，如输入设备116的输入设备适于作为触摸屏界面的一部分。  In some embodiments, input devices such as a device 116 suitable for use as part of a touch screen interface. 具体说来，显示屏至少与输入设备的感应区的一部分重叠，如感应区118。 Specifically, the display screen overlaps with at least a portion of the sensing region of the input device, such as a sensing region 118. 输入设备和显示屏一起提供了与相关的电子系统连接的触摸屏。 The input device and the touch screen display provides a connection with the associated electronic system. 显示屏可W是能够为用户提供可视化界面的任何类型的电子显示器，并且可W包括任何类型的LED(包括有机LED(化抓））、〇?1'^〔0、等离子、其他显示技术。 Display may be W is capable of providing a visual interface for the user of any type of electronic display, and may W includes any type of an LED (including an organic LED (of grasping)), square? 1 '^ [0, plasma and other display technologies. 运样实施时，输入设备被用来激活电子系统上的功能。 When the sample transport embodiment, the input device is used to activate a feature on an electronic system. 在一些实施例中，触摸屏实施通过在贴近指示出功能的图标或者其它用户界面元素的感应区放置一个或更多个对象让用户选择功能。 In some embodiments, a touch screen implemented by sensing region proximate an icon indicating the functions or other user interface element placing one or more objects allows the user to select functions. 输入设备可W被用来促进其他的用户界面交互，比如滚动、 取景、菜单导航、光标控制、参数调整等等。 W input device may be used to facilitate other user interface interaction, such as scrolling, framing, menu navigation, cursor control, parameter adjustment and the like. 触摸屏设备上的输入设备和显示屏可W广泛共享物理元件。 The input device on the touch screen display devices and wide W may share physical elements. 例如，一些显示和传感技术可W利用一些同样的电气组件来显示和传感。 For example, some display and sensing techniques may use some of the same W electrical component for displaying and sensing. 应当理解，虽然本发明的许多实施例将在运里的全功能装置的背景中被描述，但本发明的结构可W被分布为各种形式的程序产品。  It should be understood that while many embodiments of the invention will be in the context of a fully functional device in the operation are described, but the structure of the present invention W may be distributed as a program product in various forms. 例如，本发明的结构可W被实施并且被分布为计算机可读的媒体上的传感器程序。 For example, the structure of the present invention may be implemented and distributed W sensor program on a computer-readable medium. 此外，本发明的实施例不论用来实施分布的计算机可读媒介的特定类型都同样地适用。 Further, regardless of the embodiment of the present invention used to implement a particular type of computer-readable media distributed equally applicable. 计算机可读媒体的例子包括光盘、记忆棒、存储卡、内存模块等等。 Examples of computer-readable media including optical disks, memory sticks, memory cards, memory modules, and the like. 计算机可读媒体可W基于闪存的、光学的、磁性的、全息的或任何其他存储技术。 The computer-readable medium may be a flash-W, optical, magnetic, holographic, or any other memory technology. 如上所述，输入设备116适于通过响应于感应的贴近的对象和运些对象作用的力来帮助数据输入W提供用户界面功能。  As described above, the input device 116 is adapted to facilitate data input function W provided by the user interface in response to sensed objects and close objects acting force some operation. 具体说来，处理系统119被配置成对在感应区118中的传感器感应的多个对象确定位置信息。 Specifically, the processing system 119 is configured to sensors sensing the plurality of objects in the sensing region 118 to determine location information. 此外，处理系统119被配置成对从作用在表面的力的确定的位置信息和多个测量对多个对象中每一个确定力信息。 In addition, the processing system 119 is configured to information determined for each of the plurality of objects from a force acting in a defined position information of a plurality of measuring force and the surface. 因此，输入设备116的处理系统119提供确定感应区多个对象中每一个的位置信息和力信息二者的能力。 Thus, the input device 116, the processing system 119 to provide a plurality of objects in a sensing region of each of the capabilities of both the position information and force information is determined. 运可W用来帮助用户界面功能性的提高，例如，通过规定特定用户界面动作响应于对多个不同对象的位置和力的确定的指示。 W may be transported to help improve the user interface functionality, e.g., by a predetermined action in response to a particular user interface an indication of the determined position and force of a plurality of different objects. 现在转到图2和图3,其示出了感应区中的对象和作用力到表面的例子。  Turning now to FIG. 2 and FIG. 3, which shows the object in the sensing region and force to the surface of the Examples. 具体来说， 图2和图3示出了示例的输入设备200的俯视图和侧面图。 Specifically, FIG. 2 and FIG. 3 shows a top view of an example of the input device 200 and a side view. 在所示例子中，用户手指202和204 给设备200提供输入。 In the illustrated example, the user's finger 202 and 204 provide input to the device 200. 具体说来，输入设备200被配置成使用传感器在感应区206中确定手指202和204的位置。 Specifically, the input device 200 is configured to use a sensor to determine the position of the finger 202 and 204 in the sensing region 206. 例如，电容式接近传感器，采用多个传感器电极，可W被配置成通过检测在传感器电极间的跨电容式禪合的变化，来检测诸如手指202和204运样的对象，W及从已检测到的跨电容式禪合的变化来确定手指的位置。 For example, a capacitive proximity sensor, a plurality of sensor electrodes may be configured to change in W across the capacitive sensor Zen bonded between the electrodes is detected by detecting such a finger 202 and 204 of the sample transport objects, and from the detected W to cross the capacitive Zen change together to determine the location of the finger. 根据本发明的实施例，输入设备200进一步地被配置成确定手指202和204作用到表面208的力。  According to an embodiment of the present invention, the input device 200 is further configured to determine the fingers 202 and 204 of the force applied to the surface 208. 具体来说，多个力传感器210被设置在感应区206各处。 Specifically, a plurality of force sensors 210 are disposed around the sensing region 206. 运些力传感器的每个提供手指作用在表面208上的力的一测量。 Each finger provides a force acting on the surface 208 of the force sensor of a transport of these measurements. 处理系统被配置成利用传感器确定的手指位置和力传感器210提供的力的测量确定单个手指202和204的每个作用的力。 The processing system is configured to determine the force acting in each individual fingers 202 and 204 using the measured force and the position of the finger force sensor determined by the sensors 210 provided. 应该注意，被确定的力是被确定的多个手指中每个单独手指作用到表面208的力的总计。  It should be noted, the determined force is determined a plurality of fingers each individual finger surface 208 of the force applied to the total. 因此，系统可根据哪些手指按压W什么样的力做出不同的反应。 Therefore, the system can react differently depending on what kind of force which finger pressing W. 确定多个手指中每一个作用的力，W及响应于运样被确定的力提供不同的输入动作的能力，为帮助用户输入选择提供了广泛的灵活性。 Determining each of a plurality of fingers a force acting, W, and in response to the determined force is the ability to provide sample transport different input operation, provides wide flexibility to help a user input selection. 本发明的实施例可W被用来实现输入设备上各种不同的能力。  Embodiments of the invention W may be used on a variety of different input devices ability to achieve. 比如，其可W被用来使能基于力和接近指示的任何类型的用户输入。 For example, it may be used to enable W based on the force and any type of proximity indication of a user input. 比如，"按压选择"手势，其中接近指示可W被用于光标控制而力指示可W被用于选择元素。 For example, "Press select" gesture, wherein the proximity indication may be used for cursor control and the W indicates the force W can be used to select the element. 作为另一个例子，对多个对象的力和接近的连续测量值可W被用于连续手势，比如扩展放大，扩展滚动或扩展旋转。 As another example, a plurality of objects and a force close W continuous measurements may be used for continuous gesture, such as extended amplification, rolling or spreading extended rotation. 在运些情况的每种下，增加的力指示可W被用来扩展响应，因此可W被用来有选择地延伸响应。 In some cases each operation, indicating increased force may be used to extend the response W, W can thus be used to selectively extend the response. 在运些情况中，同时确定多个对象的力和接近是特别有用的，因为运为确定用户意图提供了增强的灵活性。 In some cases, transport, and determine the force and close more objects are particularly useful because transport to determine user intent provides enhanced flexibility. 如上所述，在本发明的实施例中，多个力传感器被设置到传感器周围并被配置成提供作用在表面的力的测量。  As described above, in the embodiment of the present invention, a plurality of force sensors are arranged around the sensor and configured to provide a force acting on the measurement surface. 运些单个的力传感器的每个都可WW任何合适的力传感技术实现。 These single operation force sensor may each be any suitable WW force sensing technology. 例如，力传感器可WW压电力传感器、电容式力传感器、电阻应变计和/或力感应电阻来实现。 For example, a force sensor may WW piezoelectric force transducers, capacitive force sensors, resistive strain gages and / or force sensing resistor is achieved. 此外，力传感器可W被实施成测量压缩力（即向传感器作用的力）、膨胀力（即离开传感器作用的力）、或者两者。 In addition, the force sensor may be implemented to measure W compressive force (ie a force sensor acting), the expansion force (i.e., away from the action of the force sensor), or both. 力传感器被配置成每个提供向表面作用的力的测量。  The force sensor is configured to measure each of the surface to provide a force acting. 各种不同的实施都可W被用来帮助运一测量。 W various embodiments may be used to assist a transport measurements. 例如，力传感器中的传感元件可W是直接附着在表面的。 For example, the force sensor may be sensing element W is attached directly to the surface. 例如，传感元件也可W直接附着在表面的下面或其他层。 For example, the sensing element may be directly attached to a lower surface of W or other layers. 在运样的实施例中，凭借被直接禪合到表面，每个力传感器都可W提供对正在对表面作用的力的测量。 In an embodiment the sample transport, by virtue of being directly bonded to a surface of Zen, each of the force sensors can provide a measurement of W is the force acting on the surface. 在其他实施例中，力传感器可被间接禪合到了表面。 In other embodiments, the force sensor may be indirectly bonded to the surface of Zen. 例如，通过传递力的中间禪合结构，中间材料层或者两者。 For example, the intermediate laminated structure by Zen transmission of force, the intermediate material layer, or both. 不论哪种情况，力传感器又被配置成每个提供对作用到表面的力的测量。 In either case, the force sensor is configured to measure the force and the surface of each role to provide. 根据本发明的实施例，多个力传感器被设置到传感器周围。  According to an embodiment of the present invention, a plurality of force sensors are arranged around the sensor. 正如将在下文作更详细的描述的那样，本发明的各方面允许使用相对较少的力传感器而仍然提供确定多个对象中每一个作用在表面的力的能力。 As will be described in more detail below in the following, aspects of the present invention allows the use of relatively less force sensor while still providing the ability to force a surface of each of the plurality of objects is determined role. 例如，在一个实施例中，传感器周围设置了两个力传感器。 For example, in one embodiment, the sensors are arranged around the two force sensors. 在另一例子中，传感器周围设置了=个力传感器。 In another example, it is provided around the sensor = force sensors. 在另一实施例中，传感器周围设置了四个或者更多的传感器。 In another embodiment, the sensors are arranged around four or more sensors. 正如将在下文作更详细地解释的那样，通常更多的传感器数量将提供更高的精度，且一些情况中增加了冗余度，但是添加额外的传感器也增加了成本和复杂性。 As will be explained in more detail below, usually greater number of sensors will provide higher accuracy, and in some cases, increased redundancy, but also add an additional sensor adds cost and complexity. 鉴于运些原因，在大多数实施例中，在感应区各处使用=到八个之间的力传感器将是理想的。 In view of these reasons transported, in most embodiments, the sensing region used throughout = the force sensor between the eight would be desirable. 总体上，把多个力传感器的每个设置在传感器边缘附近并最大限度地分开传感器将是理想的，因为运将易于最大化传感测量的精度。  In general, and apart from each of the plurality of force sensors disposed in the vicinity of the maximum edge sensor the sensor would be ideal, as will be readily transported to maximize the accuracy of the sensing measurements. 在大多数情况下，运将把传感器设置在靠近感应区的外缘。 In most cases, the sensor will be transported disposed near an outer edge of the sensing region. 在另外的情况下，其可能接近触摸表面的外缘，而感应区可W延伸出表面一定的距离。 In other cases, it may be close to the outer edge of the touch surface, and sensing region may extend a certain distance W surface. 最后，在其他实施例中，一个或多个传感器可能被设置在传感器内部。 Finally, in other embodiments, the one or more sensors may be disposed inside the sensor. 在图2的示例中，四个传感器210被设置在靠近矩形感应区206的周边并在表面208 的下方。  In the example of FIG. 2, four sensors 210 are disposed close to the periphery of the rectangular sensing region 206 and the bottom surface 208 of the. 转到图4,其示出了输入设备400的另一个例子。 Turning to Figure 4, which illustrates another example of the input device 400. 在该例中，=个力传感器410被设置在感应区406周边内并且在表面408的下方。 In this embodiment, the force sensors = 410 is disposed within the periphery of the sensing region 406 and 408 below the surface. 在该例中，相比于图2所示的那些，力传感器410 被设置得离周边更远。 Those force sensors in this example, as shown in FIG. 2 as compared to 410 are disposed farther away from the periphery. [004引转到图5,其示出了输入设备500的另一个例子。 [004 lead to FIG. 5, which illustrates another example of the input device 500. 在该例中，五个力传感器510被设置在感应区506周边内并且在表面508的下方。 In this embodiment, the five force sensor 510 is provided within the periphery of the sensing region 506 and 508 below the surface. 在该实施例中，力传感器510中的一个被设置在了感应区506的中央区域，而另外四个传感器510被设置在更接近感应区506的周边。 In this embodiment, a force sensor 510 is provided in the central area of ​​the sensing region 506, while the other four sensors 510 are disposed closer to the periphery of the sensing region 506. 转到图6,其示出了输入设备600的另一个例子。  Turning to Figure 6, which illustrates another example of the input device 600. 在该例中，四个力传感器610被设置在感应区606的周边内并在表面608的下方。 In this embodiment, the four force sensors 610 are disposed in the peripheral region 606 and beneath the sensing surface 608 in. 在该实施例中，力传感器610的每个都提供更大矩形区域上的力的测量。 In this embodiment, each force sensor 610 provides a measure of the force over a larger rectangular area. 该类型的传感器可W用力感应电阻或其他合适的设备来实现。 This type of force sensing resistors sensor W, or other suitable devices to achieve. 本发明的实施例也适用于不同形状的输入设备。  Embodiments of the present invention is also applicable to an input device of a different shape. 转到图7,其阐明了输入设备700 的另一个例子。 Turning to Figure 7, which illustrates another example of an input device 700. 在该例中，=个力传感器710被设置在感应区706的周边内并且在表面708的下方，其中感应区706具有圆形的形状。 In this embodiment, the force sensors = 710 is disposed within the perimeter of the sensing region below the surface 706 and 708, wherein the sensing region 706 has a circular shape. 在运样的实施例中，传感器可W不同的坐标系来提供位置信息，如W极坐标。 In an embodiment the sample transport, the sensor may be a different coordinate system W to provide location information, such as polar coordinates W. 然而，在运种传感器中，直接或通过坐标转换，也可W提供XY坐标系的使用。 However, in kinds of sensor operation, directly or through coordinate conversion, W may also be provided using the XY coordinate system. 应当注意，虽然图2-7阐明了很大程度上具有共同范围的各种感应区和表面，但并不是在所有实施例中都要求如此。  Note that although Figures 2-7 illustrate the various sensors and the surface region have a common range is largely, but not in all embodiments require so. 例如，在一些实施例中感应区的形状可能远远超出呈现给用户的主表面。 For example, in some embodiments, the shape of the sensing region may be presented to the main far beyond the surface of the user. 在另外的实施例中，也许刚好相反。 In further embodiments, maybe just the opposite. 正如将在下文作更详细地解释的那样，输入设备的表面和其他层可W用具有不同物理性质的不同类型的材料来实施。  As will be explained in more detail below, the surface layer and other input devices may be W with a different type of materials having different physical properties to the embodiment. 例如，表面可W用具有不同物理硬度级别的材料实施。 For example, W can be a surface material having a different physical embodiment hardness levels. 因此，在一些实施例中表面可W随用户作用力而明显地偏转和弯曲。 Thus, in some embodiments, W may be a surface with a user force significantly deflect and bend. 在另一些实施例中，表面将拥有更大的硬度，因此在正常使用时可W很大程度地避免弯曲。 In other embodiments, the surface will have greater stiffness, thus during normal use can bend W largely avoided. 运些不同的实施可W 给用户不同的用户体验。 These different implementations may transport W user experience to different users. 例如，易于偏转给用户提供了与他们作用的力相对应的反馈的途径。 For example, users with a easy way to deflect the force and effect of their corresponding feedback. 通常，为了提供显著的偏转量，传感器可被配置W给感应层提供适当弯曲的空间的结构。 Typically, in order to provide a significant amount of deflection, the sensor may be configured to provide space W of the bent appropriately to the sensing layer. 例如，通过使用类似弹黃的结构。 For example, by using a structure similar to the spring. 此外，正如将在下文更详细地讨论的那样，用来确定感应区中多个对象中每一个的力的技术可适于说明使用过程中可能发生在表面上的偏转的总量。 Furthermore, as will be discussed in greater detail below, the techniques used to determine the force sensing region of each of the plurality of objects may be adapted to the total amount of instructions that may occur during use on the surface deflection. 下面将不详细讨论可被用于确定感应区中多个对象的力信息的技术。  will not be discussed technical force information may be used to determine a plurality of objects in the sensing region in more detail below. 总体上，该技术利用通过传感器确定的每个对象的位置信息和力的多个测量来为每个对象确定作用力的总量。 Generally, the technique using the plurality of measured force and position information for each object is determined by the sensors to determine the total force for each object. 具体来说，该技术基于多个对象中每一个的位置信息利用力的多个测量的叠加来为每一个对象确定作用的力。 In particular, the technique to determine the force acting on the object for each of a plurality of superimposed plurality of measurement objects using the location information of each of the force. 在该实施例的一个实现中，此叠加通过伪逆矩阵技术来计算出。 In one implementation of this embodiment, this is calculated by superimposing a pseudo inverse matrix technique. 因此，使用伪逆矩阵技术，处理系统可W求出两个对象的力值Fo, Fi。  Thus, using a pseudo inverse matrix technique, two processing system may determine the object W force value Fo, Fi. 具体说来，伪逆矩阵技术(有时叫做广义逆技术)提供一种可W用来通过最小化解中的误差来解出其中方程多于未知数的超定系统的技术。 Specifically, the pseudo-inverse matrix technique (sometimes called generalized inverse technique) to provide a W techniques used to solve an overdetermined system wherein equations than unknowns resolved by minimizing errors. 在一些实施中，此技术被配置成最小化全局误差。 In some implementations, this technique is configured to minimize global error. 在其他实施中，此技术被配置成至少最小化均方误差。 In other implementations, this technique is configured to at least minimize the mean square error. 不论哪种情况，伪逆矩阵技术最小化误差W提供运个方程组的解。 In either case, a SLM equations pseudo inverse matrix W provide a technique to minimize the error. 应当注意伪逆矩阵技术只是各类可用技术的一个例子，并且总体上，可W使用任何能被用于解出超定系统的技术。 It should be noted that the pseudo inverse matrix technique is just one example of various types of technology available, and generally, any technique can be used for W surplus solution given system. 因此，处理系统可接收两个对象(XO，yo)，（XI，yi)每一个的位置信息，四个已测出的力值化1听川8川81〇，并^此确定两个对象发每一个正在作用的单个力航，尸1)。  Thus, the processing system may receive two objects (XO, yo), (XI, yi) of the position information of each of the four force values ​​have been measured of a plain plain 81〇 8, and this determines ^ two objects are each made of a single acting Air force, P 1). 定义了将要确定的由=个对象作用的力(的方1，。2)。  defined to be determined by the force acting = object (square 1, .2). 此矩阵方程描述了具有=个未知数的四个方程的集合，并且处理系统可适于利用与前述相同的伪逆关系求解那些未知数。 This matrix equation describes a set of equations having four unknowns =, and the processing system may be adapted by the same pseudo-inverse relationship with the solving these unknowns. 运些示例提供了确定感应区中两或=个对象作用的力的能力。  These exemplary operation provides the ability to determine the force sensing region two objects or action =. 应当注意，虽然运些示例描述使用包含四个力传感器的系统求出力值，类似的技术也可W被应用于具有不同力传感器数量的系统中。 It should be noted that, although some examples describe the use of transport system comprises four of the force sensor output demand value, similar techniques can also be applied to a number of different W force sensor system. 通常，每个额外的力传感器提供额外数据，其可W被用来确定力。 Typically, each additional data to provide additional force sensor, which can be used to determine the force W. 因此，更多的传感器增加了可W用来生成解的方程的数目。 Thus, additional sensors may be W increases the number of solutions to equation generation. 和上述相同类型的技术因此可W被用来解运样的超定系统，通常使确定的力具有更高的精确度。 And said same type of technology can thus be used to solve overdetermined W sample transport system, usually a force determined with higher accuracy. 此外，使用更多数量的传感器可在传感器发生故障时提供冗余。 In addition, a greater number of sensors may be used to provide redundancy in case of sensor failure. 如上所述，输入设备可W用各种不同的材料来实施，包括具有不同硬度级别的表面材料。  As described above, the input device may be a variety of different materials W to embodiments, the surface comprises a material having a different hardness levels. 在表面材料被配置成可W随作用的力而显著弯曲和偏转的实施例中，系统可被配置成可W解释那些偏转。 The surface of the material is configured to be a force W acting with significantly bent and deflected embodiments, the system may be configured to be W explain the deflection. 运可W带来对运些实施例中作用的力更精确的确定。 Yun W can lead to more accurate determination of these transport force acting Example embodiment. 矩阵方程5再次描述了具有两个未知数（即，由对象作用的力Fo,Fi)的四个方程的集合。  Equation 5 again describes matrix having a set of two unknowns (i.e., the target acting force Fo, Fi) of the four equations. 运两个未知数可W再用伪逆矩阵技术或任何其他适于解出超定系统的技术来解出。 W may be transported again two unknowns pseudo inverse matrix technique or any other suitable technique surplus solution to solve a given system. 限定要被确定的S个对象作用的力(。〇术1，。2)。  The force S is defined to determined the effect of objects (1 .〇 surgery, .2). 该矩阵方程描述了具有^个未知数的四个方程的集合，而处理系统可适于利用与前述相同的伪逆关系求解运些未知数。 This matrix equation describes a set of equations with four unknowns ^ and the processing system may be adapted to use the same pseudo-inverse relationship with the transport solving these unknowns. 方程5和6中定义的关系同样可适于具有不同数量、形状W及力传感器的配置的传感器。  Equations 5 and 6, the relationship may be defined in the same sensor having a configuration adapted to a different number, shape, and W is a force sensor. 当如此确定时，力的值可W被用来帮助许多用户界面功能性。  When the thus determined value of the force W may be used to help many user interface functionality. 如上所述，系统可W 被用来使能基于力和接近指示的任何类型的用户输入。 As described above, the system may be used to enable input W based on the force and any type of proximity indication of the user. 例如，对多个对象的力和接近的持续测量可W被用于扩展放大，滚动或旋转。 For example, a plurality of force and proximity to objects W can be used for continuous measurement extended amplification, rolling or rotation. 其也可W被用于虚拟键盘应用和按压W选择手势。 It can also be used for the virtual keyboard application W and W is pressed to select gestures. 在运些实施例的变化中，力传感器提供的力的测量也可W被用来消除对象位置的模糊性。  In some embodiments the change operation, the measurement of the force provided by the force sensor may be used to eliminate ambiguity W target position. 具体来说，在一些类型的传感器中，感应区中出现的两个对象会导致对象位置模糊。 In particular, in some types of sensors, two objects appearing in the sensing region can result in blurred object position. 在使用被配置成生成一维轮廓W及从运些一维轮廓中生成对象位置的电容式接近传感器的输入设备中运是一个典型的问题。 In use configured to generate a one-dimensional profile of the object W generated from the position and operation of these one-dimensional profile of the capacitive proximity sensor operation input device is a typical problem. 转到图8,其示出了示例的输入设备800。  Turning to Figure 8, which shows an example of the input device 800. 输入设备800包含了一传感电极阵列803 W及四个力传感器Fl，F2，F3和F4。 The input device 800 includes an array of sensing electrodes 803 W and four force sensors Fl, F2, F3 and F4. 同样示出的是可从电极803的感应区中存在的两个对象生成的X和Y坐标轮廓801。 Also shown is the presence of two objects from the sensing region of the electrode 803 in X and Y coordinates generated contour 801. 如图8所示，单WX和Y坐标轮廓数据，存在关于两个对象是在位置802或位置804(图8中用楠圆虚线示出了可能的位置)的模糊，因为任何一个选择都会带来同样所示的X和Y坐标轮廓801。 8, WX and Y coordinates of the single contour data, regarding two objects are present at a position 802 or position 804 (dotted line circle in FIG. 8 by Nan shows a possible location of) blur, because any choice will bring a to X and Y coordinates 801 as shown in the same profile. 在该实施中，由力传感器Fl - F4提供的力的测量可W被用来消除对象位置的模糊性。  In this embodiment, by the force sensor Fl - F4 provide a measurement of the force W may be used to eliminate the ambiguity of the position of the object. 具体说来，因为越靠近对象，传感器上的作用力越高，力的测量可W被用来确定对象实际位于两个位置中哪一个。 Specifically, since the closer the object, the higher the force sensor measuring the force W may be used to determine the actual object which is located in two positions. 例如，如果力传感器Fl和F3测量到的力明显大于传感器F2和F4 的，运就表示对象很可能在位置802。 For example, if the force sensors Fl and F3 is significantly greater than the measured force F2 and F4 of the sensor, it means the object is likely to run in the 802 position. 反之，如果力传感器F2和F4测量到的力明显大于传感器Fl和F3的，运就表示对象很可能在位置804。 Conversely, if the force sensor F2 and F4 significantly greater than the measured force sensors Fl and F3, the operation is likely to represent the position of the object 804. 因此，力的测量可W被用来消除两个对象位置的模糊性。 Therefore, measuring the force W may be used to disambiguate the two object position. -旦对象位置的模糊性被消除了，每个对象的单个力的值就可W像上述那样被计算出。  - Once target position ambiguity is eliminated, the value of each single force object W can be calculated as described above. 因此，来自力传感器的测得的值可W被用来消除对象位置的模糊性，W及通过确定的对象位置，来确定每个单独对象作用的力。 Thus, the measured value from the force sensor may be used to eliminate ambiguity W target position, W, and by determining the object position, the object to determine the effect of the force of each individual. 利用力传感器来消除模糊性，可W顾及使用低成本的轮廓传感器，其否则在某些情况下无法消除多个手指位置的模糊性。 To eliminate ambiguity, W may take into account the use of low-cost profile sensor or in some cases can not disambiguate multiple finger positions with the force sensor. 因此，本发明的实施例提供了设备和方法，其从感应区中多个对象中每一个的位置信息W及力信息二者来帮助确定用户输入。  Thus, embodiments of the present invention to provide an apparatus and method which from the plurality of objects in the sensing region of each of both the location information W and force information to help determine the user input. 在运些实施例中，处理系统被配置成确定感应区中传感器感应到的多个对象中每一个的位置信息。 In some embodiments, operation, position information processing system is configured of a plurality of objects detected by the sensors sensing region in each to determine. 此外，处理系统还被配置成从作用到表面的力的位置信息W及多个测量确定多个对象中每一个的力信息。 In addition, the processing system is further configured to force information of each of the plurality of objects is determined from the force applied to the surface W and the position information of the plurality of measurements. 因此，此设备和方法提供了确定感应区中多个对象中每一个的位置信息和力信息二者的能力。 Thus, this provides a method and apparatus to determine a plurality of objects in the sensing region of each of the capabilities of both the position information and force information. 运可W用来帮助提高用户界面功能性，例如，通过规定特定的用户界面动作来响应对多个对象的力的确定的指示。 W may be transported to help improve the user interface functionality, e.g., in response to an indication of the force is determined a plurality of predetermined objects by specific user interface action. 运里给出的实施例和示例是为了最好地解释本发明和它的特定应用，W及从而使本领域的技术人员能够制作并使用本发明而呈现的。  The embodiments and examples given are transported in order to best explain the present invention and its specific application, W, and thereby enable others skilled in the art to make and use the invention presented. 然而，本领域的技术人员将会意识到前面的描述和示例只是为了说明和举例的目的而呈现的。 However, those skilled in the art will appreciate that the foregoing description and examples are merely for purposes of illustration and example and presented. 所给出的描述并不是旨在穷尽或者将本发明限制于所公开的确定的形式。 Given description is not intended to be exhaustive or to limit the invention to the form disclosed determined. 1. 一种输入设备，包括： 基本刚性的表面； 被配置成同时地感应在贴近所述表面的感应区中的多个对象的传感器； 多个力传感器，所述多个力传感器的每个都被耦合到了所述表面使得所述多个力传感器提供对作用到所述表面的力的多个测量； 耦合到所述传感器和所述多个力传感器的处理系统，该处理系统被配置成： 确定由所述感应区中的传感器同时地感应到的所述多个对象中每一个的位置信息；以及从以下确定所述多个对象中每一个的力信息： 所述多个对象中每一个的位置信息；以及作用在所述表面上的力的多个测量。 An input apparatus, comprising: a substantially rigid surface; a plurality of sensors configured to objects in the sensing region proximate the surface of the simultaneously sensed; each of the plurality of force sensors, the plurality of force sensors are coupled to the surface so that the plurality of force sensors provides a plurality of measuring force acting to the surface; coupled to the sensor and the force sensors of the plurality of processing systems, the processing system is configured to : determining the location information of the plurality of objects in the sensing region of the sensor simultaneously sensed in each; and determining from the force information of each of the plurality of objects: the each of the plurality of objects a position information; and a plurality of measurement of the force acting on the surface. 2. 如权利要求1所述的输入设备，其中，所述多个力传感器至少包括三个力传感器。 2. The input apparatus according to claim 1, wherein the plurality of force sensors comprises at least three force sensors. 3. 如权利要求1所述的输入设备，其中，所述多个对象包含两个或三个对象。 The input device according to claim 1, wherein said plurality of objects comprises two or three objects. 4. 如权利要求1所述的输入设备，其中，所述传感器从电容式传感器和光学传感器组成的组中选取。 The input apparatus as claimed in claim 1, wherein the sensor group from an optical sensor and a capacitive sensor consisting of selection. 5. 如权利要求1所述的输入设备，其中，所述多个力传感器的每一个被设置在所述感应区的周边附近。 5. The input apparatus according to claim 1, wherein each of the plurality of force sensors is disposed in the vicinity of a periphery of said sensing area. 6. 如权利要求1所述的输入设备，其中，所述多个力传感器的每一个是从压电力传感器、电容式力传感器、电阻应变计和力感应电阻组成的组中选取。 6. The input apparatus according to claim 1, wherein the plurality of force sensors each of which is selected from the group of piezo-electric sensors, capacitive force sensors, force sensing resistors and the strain gauge resistors is selected. 7. 如权利要求1所述的输入设备，其中，所述多个力传感器的每一个都被配置成测量压缩和膨胀二者。 7. The input apparatus according to claim 1, wherein the plurality of force sensors are each configured to measure both compression and expansion. 8. 如权利要求1，2,3,4,5,6与7中任意一项所述的输入设备，其中，所述处理系统被配置成从所述多个对象中每一个的位置信息以及作用在所述表面的力的所述多个测量为所述多个对象的每一个确定力信息，其通过以下方式： 基于所述多个对象中每一个的位置信息利用力的所述多个测量的叠加。 5, 6 and 7, 8 according to any one of the input device, wherein the processing system is configured to position information from each of the plurality of objects according to requirements and the plurality of measurements of the surface force acting on the force information is determined for each of the plurality of objects, which in the following manner: the plurality of location information based on the force of each of the plurality of objects of overlay measurement. 9. 如权利要求1，2,3,4,5,6与7中任意一项所述的输入设备，其中，所述处理系统被配置成从所述多个对象中每一个的位置信息以及作用在所述表面的力的所述多个测量为所述多个对象的每一个确定力信息，其通过以下方式： 基于所述多个对象中每一个的位置信息解限定力的所述多个测量的叠加的超定系统方程。 1,2,3,4,5,6 9. The input device according to any of the 7, wherein the processing system is configured and claims the position information from each of a plurality of objects a plurality of measuring force acting on the surface of the force is determined for each of the plurality of information objects, for which the following manner: the plurality of objects based on the position of each defined force information demultiplexing superimposed overdetermined system of equations measurements. 10. 如权利要求1，2，3，4,5，6与7中任意一项所述的输入设备，其中，所述处理系统被配置成从所述多个对象中每一个的位置信息以及作用在所述表面的力的所述多个测量为所述多个对象的每一个确定力信息，其通过以下方式： 基于所述多个对象中每一个的位置信息利用伪逆矩阵技术确定对力的所述多个测量的叠加。 10. 1,2,3,4,5,6 input device according to any of the 7, wherein the processing system is configured and claims the position information from each of a plurality of objects measuring the acting surfaces of said plurality of force to each of the plurality of objects to determine force information, by the following manner: based on the position information of each of the plurality of objects using a pseudo inverse matrix technique for determining superimposing said plurality of measured force. 11. 如权利要求1，2,3,4,5,6与7中任意一项所述的输入设备，其中，所述多个力传感器被设置成使得所述多个力传感器中的至少两个的每一个靠近所述感应区的角落。 At least two as claimed in claim 1,2,3,4,5,6 input device according to any one of 7, wherein the plurality of force sensors are arranged such that the plurality of force sensors a near every corner of the sensing area. 12. 如权利要求1，2,3,4,5,6与7中任意一项所述的输入设备，其中，所述处理系统被配置成对所述感应区中的传感器感应到的多个对象中每一个确定位置信息，其通过以下方式： 利用作用在所述表面的力的所述多个测量的至少一个来消除所述位置信息的模糊性。 1,2,3,4,5,6 according to claim 7 and any one of said input apparatus, wherein the processing system is configured to pair the sensing region of the sensor senses the plurality of determining position information for each subject, by the following manner: the surface of said plurality of measured force to eliminate at least one of the location information by the action of the ambiguity. 13. -种输入设备包括： 基本刚性的表面； 电容式传感器，其被配置成同时容性感应在贴近所述表面的感应区中的至少两个对象； 至少三个力传感器，所述至少三个力传感器的每个都被耦合到了所述表面使得所述至少三个力传感器提供作用到所述表面的力的至少三个测量，其中所述至少三个力传感器中的至少两个被放置在靠近所述感应区的周边； 耦合到所述电容式传感器和所述至少三个力传感器的处理系统，所述处理系统被配置成： 确定所述感应区中的传感器同时感应到的所述至少两个对象中每一个的位置信息；以及从以下内容确定所述至少两个对象中的每一个的单个的力信息： 所述至少两个对象中每一个的位置信息；以及作用在所述表面的力的所述至少三个测量。 13. - types of input device comprising: a substantially rigid surface; a capacitive sensor, which is configured to simultaneously capacitively induced at least two objects proximate said surface sensing region; at least three force sensors, said at least three each of the force sensors are coupled to the surface such that the at least three force sensors acting to provide at least three force measuring surface, wherein are placed at least two of the at least three force sensors near the periphery of said sensing region; a processing system coupled to the capacitive sensor and the at least three force sensors, the processing system is configured to: determine the sensing region to said sensor simultaneously sensing position information of the at least two of each of the objects; and determining at least two of the individual objects from the force information of each of the following: location information of said at least two of each of the objects; and the role of the the surface of the at least three force measuring. 14. 一种输入方法，包含如下步骤： 以传感器同时地感应多个对象； 对所述传感器同时地感应到的多个对象的每一个确定位置信息； 确定作用到所述传感器表面的力的多个测量，所述表面是基本刚性的；以及从以下内容确定所述多个对象中每一个的力信息： 所述多个对象中每一个的位置信息；以及作用到所述表面的力的所述多个测量。 14. An input method, comprising the steps of: sensing a plurality of objects simultaneously sensor; determining positional information for each of the plurality of objects simultaneously sensed sensor; determining force applied to the sensor surface of said multi- measurement, the surface is substantially rigid; and determining from the force information following each of the plurality of objects: the location information of the plurality of objects each; to the surface, and the effect of the force said plurality of measurements. 15. 如权利要求14所述的方法，其中，力的所述多个测量至少包含力的三个测量。 15. The method as claimed in claim 14, wherein said plurality of measurements comprising at least the force of the force of three measurements. 16. 如权利要求14所述的方法，其中，所述多个对象包含两或三个对象。 16. 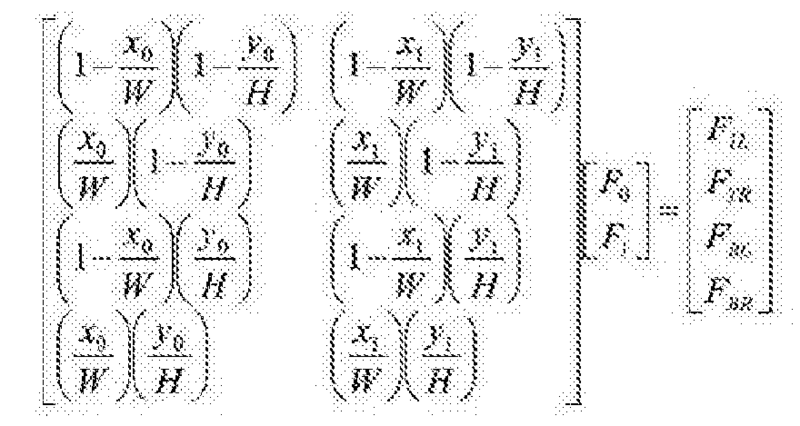 The method according to claim 14, wherein said plurality of objects comprising two or three objects. 17. 如权利要求14所述的方法，其中，以传感器感应多个对象的步骤包括以由电容式传感器和光学传感器组成的组中的至少一个来感应。 17. The method according to claim 14, wherein the step of sensing a plurality of objects to the sensor including at least one of the group consisting of inductive and capacitive sensor consisting of an optical sensor. 18. 如权利要求14所述的方法，其中，确定作用到所述传感器表面的力的多个测量的步骤包括使用被设置到所述表面的周边附近的多个力传感器。 18. The method as claimed in claim 14, wherein determining the force applied to the sensor surface of the plurality of measurements comprises the step of using a plurality of force sensors near the perimeter of the surface is set to. 19. 如权利要求14所述的方法，其中，确定作用到所述传感器表面的力的多个测量的步骤包括使用从由压电式力传感器、电容式传感器、电阻应变计和力感应电阻组成的组中选取的力传感器。 19. The method as claimed in claim 14, wherein determining the force applied to the surface of the sensor measurements comprises the step of using a plurality of piezoelectric force sensor from a capacitive sensor, a resistive strain gauge force sensing resistors, and the force sensor group selected. 20. 如权利要求14所述的方法，其中，确定作用到所述传感器表面的力的多个测量的步骤包括使用被配置成测量压缩和膨胀二者的力传感器。 20. The method according to claim 14, wherein the step of determining a plurality of measurements applied to the sensor surface force measurements includes using both compression and expansion of the force sensor is arranged. 21. 如权利要求14所述的方法，其中，确定作用到表面的力的多个测量的步骤包括使用被设置成使得至少两个力传感器靠近所述表面的角落的力传感器。 21. The method according to claim 14, wherein the plurality of measurements to determine the effect of a force step comprises using surface are arranged such that the at least two force sensors of the force near the corner of the sensor surface. 22. 如权利要求14，15，16，17，18，19，20或21所述的方法，其中，从所述多个对象中每一个的位置信息以及作用到所述表面的力的多个测量确定所述多个对象中每一个的力信息的步骤包括： 基于所述多个对象中每一个的位置信息解限定力的所述多个测量的叠加的超定系统方程。 Plurality, wherein, from the plurality of objects to each of the force and the location information of the active surface 22. The method of claim 14,15,16,17,18,19,20 or 21 as claimed in claim measuring the force information is determined for each of the plurality of objects comprises the step of: superimposing an overdetermined system of equations based on the plurality of measurement positions of each of the plurality of objects in a defined force information Solutions. 23. 如权利要求14，15，16，17，18，19，20或21所述的方法，其中，从所述多个对象中每一个的位置信息以及作用到所述表面的力的多个测量确定所述多个对象中每一个的力信息的步骤包括： 基于所述多个对象中每一个的位置信息利用力的所述多个测量的叠加。 Plurality, wherein, from the plurality of objects to each of the force and the location information of the active surface 23. The method of claim 14,15,16,17,18,19,20 or 21 as claimed in claim measuring the force information is determined for each of the plurality of objects comprises the step of: superimposing the plurality of measurement positions based on the force information of the plurality of objects each. 24. 如权利要求14，15，16，17，18，19，20或21所述的方法，其中，从所述多个对象中每一个的位置信息以及作用到所述表面的力的多个测量确定所述多个对象中每一个的力信息的步骤包括： 基于所述多个对象中每一个的位置信息利用伪逆矩阵技术确定力的所述多个测量的叠加。 Plurality, wherein, from the plurality of objects to each of the force and the location information of the active surface 24. The method of claim 14,15,16,17,18,19,20 or 21 as claimed in claim measuring the force information is determined for each of the plurality of objects comprises the step of: said plurality of objects based on the positional information of each of a technique using a pseudo inverse matrix of the plurality of determining the superimposition of the measured force. 25. 如权利要求14，15，16，17，18，19，20或21所述的方法，其中，对所述传感器感应到的多个对象的每一个确定位置信息的步骤包括利用作用在所述表面的力的所述多个测量的至少一个来消除所述位置信息的模糊性。 14,15,16,17,18,19,20 or 25. The method according to claim 21, wherein the step of determining the position information of each of a plurality of objects comprises the sensor senses in use the action said surface of said at least one of the plurality of force to remove the ambiguity of the location information measurement.